BEIJING (Reuters) - China is part of "intensive" talks on a global trade pact regarding information technology products, the World Trade Organization's chief said on Saturday, but it is unclear if a deal will be made at a meeting of Asia-Pacific leaders underway in Beijing. The United States and other countries have been hopeful that China would sign on to the Information Technology Agreement (ITA), which requires signatories to eliminate duties on some IT products, during the Asia-Pacific Economic Cooperation summit that ends on Tuesday. 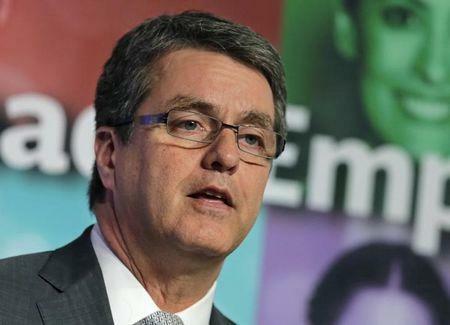 Washington has blamed China, the world's biggest exporter of IT products, for derailing talks on an update to the 16 year old WTO pact on technology trade by asking for too many exemptions. "I don't know about the intention of the (Chinese) authorities, whether they intend to conclude it here or not," WTO chief Roberto Azevedo told reporters during an APEC briefing. "What I know is that conversations are happening, they are intensive and my hope is that these negotiations would be concluded as quickly as possible," Azevedo said. Washington has warned that China must move ahead with the ITA or risk upsetting other trade talks, namely a U.S.-China bilateral investment treaty currently in the works. U.S. Trade Representative Michael Froman has said updating the deal would also give a boost to the WTO, which is facing its worst crisis in two decades. Trade experts say that the WTO still has an important role as a forum for settling commercial disputes, but that role will be degraded and increasingly obsolete if its two-decade-old trade rules do not evolve. Critics have questioned why China, which has said it wants to help reinvigorate the WTO, so far has been resistant to the ITA. China has argued that a reduction in tariffs on some products would be unfair and that the agreement should take into account countries' different stages of development. Talks on the ITA during APEC come amid broader controversy over the future of regional free trade frameworks. China's Commerce Minister Gao Hucheng said at a separate briefing that officials had formally proposed a feasibility study on the China-backed Free Trade Area of the Asia-Pacific (FTAAP), although it will still need approval from senior leaders next week. China is pushing FTAAP, but some see the proposal as a way to divert attention from the more comprehensive U.S.-backed Trans-Pacific Partnership (TPP) plan being negotiated by 12 countries, not including China.